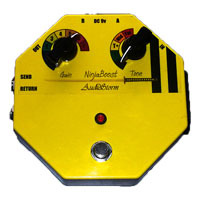 Ninja Boost is our flagship product: A hand built, unique multi-function, state of the art solo booster for demanding professionals who want repeatable, indestructable, pure, surgically precise control without compromise. There is an absolute buttload of electronical magickal fandoolery inside this weird little octagonal pedal. But this isn't some crappy, dirty million dB boost-o-drive, this is a professional solo BEAST designed to give you exactly the right amount of boost to sound like a GOD on stage next to your band. All you do is whack this right at the END of your chain, after your distortion pedals, after all the dirt, choose how many decibels of MORE you need, pick a tone shape from the four options and KABOOM! Your solos NEVER sounded so good. Not enough? Then put your favourite delay or Reverb in the effects loop and not only will it buffer it to make it sound bette rthan ever but it'll keep the tails! Yes, that's right, no more chopped off solo ends, you can keep those repeats going from here to eternity! STILL not enough?! How about synced A/B/Mix outputs so you can run multiple amplifiers?! Maybe switch between one for regular and one for boost, or, have one running all the time and just ADD a SECOND amp when you BOOST?! A solo-channel effects loop that keeps your reverb or delay tails when you go back to bypass. A(Bypass)/B(Solo) outputs for switching between multiple amps or vintage amps with multiple inputs. Solid cast aluminium chassis with easy-access PP3 battery box. Top end, low noise, wide track, custom fibreglass circuit boards. Boost level in switched 1dB steps so you can get the exact same volume night after night, hassle free. The Ninja features offers four unique tone modes plus no-tone-please. Mode T : A subtle treble lift with a very slight roll off of the extreme HF. Mode T+ : A stronger, more defined version of Mode T.
Mode Mid : A traditional boost aimed just below treble with a smooth HF. Mode Fat : A warmer, upper mid style boost with a moderately strong HF reduction for warm leads. This is a boutique effects unit, hand made in Great Britain using British made components. Although we work to a very high standard, please don't expect the varnish, logos and finish to be perfect; it's hand-made.